Wedding guests always have tons of gift and registry questions—trust us. Here’s the wedding registry etiquette for guests you need to know. Wedding registry etiquette for guests can get confusing. After all, there doesn’t seem to be a rule book. Well, at least there wasn’t a rule book — until now! Confused about how to shop for the happy couple? We’ve got you covered. 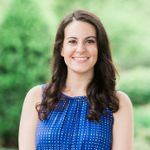 Below you'll find all the wedding registry tips and tricks you need know to make certain you’re following wedding registry etiquette the next time you're invited to a wedding. Got gift and registry questions? Who doesn't. Here’s the wedding registry etiquette for guests you need to know. How Do I Find Out Where They’re Registered? Wedding registry etiquette step #1: Locate the wedding registry. This should be relatively easy. If you’ve received a wedding invitation, a save the date, or an invite to a pre-wedding party like a shower or engagement party, check the invitation for a wedding website. If one is listed, you should find the registry information and links provided on the website. Not there? A simple Google search of their names may also turn up online registries, their page on a universal registry site like WeddingWire Registry, or their wedding website. If that fails, it’s absolutely okay to ask the couple where they’re registered — trust us, they won’t be offended that you want to buy them a gift! — or check with a close friend or family member to see if they know. How Much Time Do I Have to Give a Wedding Gift? Wedding etiquette says you have a year from the wedding date to send a gift. That being said, the sooner you send a gift their way, the better. Most guests will send a gift one month before, or within a month from the big day. Is It Okay to Veer Off the Registry? Yes, according to wedding registry etiquette for guests, it’s okay to shop off registry — under the right circumstances. If you know the bride or groom super well — we’re talking family member or best friend levels here — you can use your close connection to buy the happy couple something personal and special. But use your knowledge of the couple to your advantage, and only buy something you know will hold special value for them (a custom portrait, a gift certificate to a favorite restaurant, or a spa day, for instance). The other two times to shop off registry: If their registry is completely bought out or if you just can’t afford anything on their wish list. 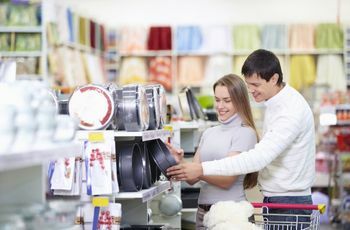 In both situations, take a deep look at their wedding registry to figure out their couple style and shop for something complementary to what they’ve already requested. What If the Couple’s Registry is Out of Gifts? This is when wedding registry etiquette for guests gets extra tricky. If the registry is out of gifts, you can always ask the couple if there’s something extra that they may want. Don’t want to bug them during wedding planning? Take a deep dive into the gifts they registered for and buy them something complementary, or a gift certificate to one of the stores they’ve chosen to register at. You can also go more personal, with an experience they can enjoy on their honeymoon, a gift certificate to a restaurant for a date night, or custom piece of art to help them remember their wedding day. Can I Just Give Them Money? We can’t think of a couple that wouldn’t enjoy a little extra cash, especially after planning a wedding and honeymoon. So yes, feel free to give the newlyweds a check. 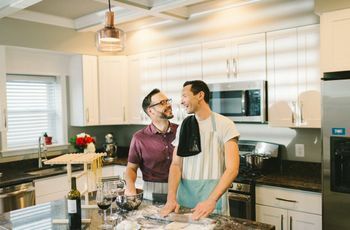 But before you do, follow wedding registry etiquette and make sure the couple hasn’t created a cash or honeymoon fund, where you can put that money towards an experience on their honeymoon or at home. Either way, a check is a totally appropriate wedding gift. 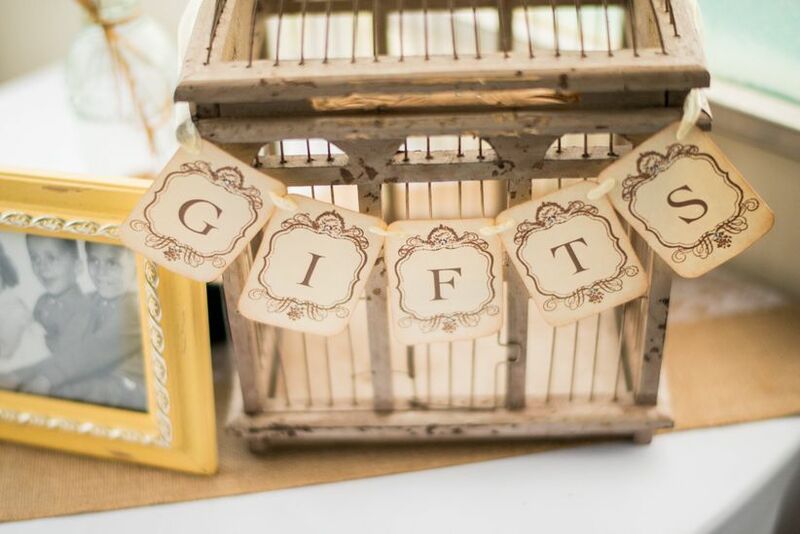 Do You Have to Buy a Bridal Shower Gift and a Wedding Gift? Yes, you should always give both a bridal shower gift and a wedding gift — but you don’t have to break the bank to do so. If you know you’ll be invited to pre-wedding events on top of the big celebration, create an overall “gift budget”. The largest portion of that budget should go towards the wedding gift, and about 20 percent towards the shower gift. 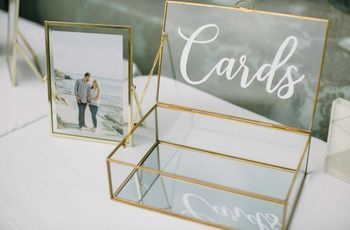 If you would rather go big on a single gift, send the big ticket item to the couple before the shower, or at least write a nice card and let the bride now something is coming her way on the big day. Can I Buy a Group Gift? Let’s face it: Betrothed couples can get a little fancy with their wedding registries, and sometimes those wishlists go beyond the means of our wallets. If you want to buy one of the pricier gifts on their list, go ahead and get a group of friends together to split the cost. It’s totally acceptable to group-gift big-ticket items.